the apartments share the same entrance and reception as the Samba hotel and so when you arrive, everything feels very upmarket, unfortunately that feeling ends when you enter your apartment. The rooms were tired and old with a basic kitchen that was dark and 'sticky' with age. There was a large lounge with sofa beds and tv. The seperate bedroom was big with lots of hanging space, overall we didnt hate the place but it was a bit scruffy. 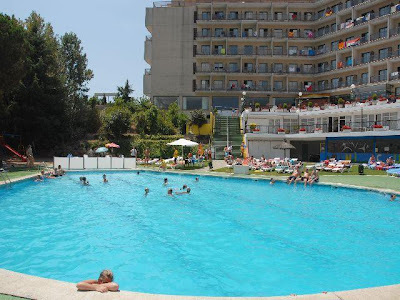 The big bonus was being able to use the hotels pool and facilities because they are excellent, there is a very large terraced area to enjoy a drink, there is also a computer area with wifi (to pay) and the location is fantastic, midway between Lloret and Fenals.